The sun was barely up when we left the Balloon Camp in Tarangire National Park, Tanzania. The Park lies to the south of the large open grass plains of southern Masiland 120 miles south of Arusha and is one of the best kept secrets on the northern safari circuit. Much of its richness it owes to the Tarangire River that flows through the Park creating a rich, green belt of life supporting a dense population of animals. We had gone barely three miles down the winding dirt road in and amongst a savanna landscape of treed grassland that parallels the River when we spotted him. 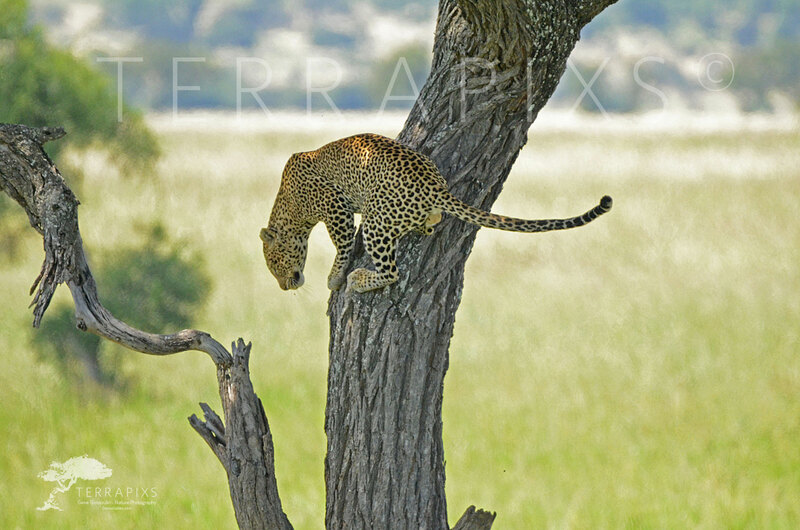 Not 75 feet away, perched in a gnarled tree, the African leopard’s (Panthera pardus ) spotted coat stood out against a sea of green backdrop of acacia and the majestic Baobob tree. African leopards exhibit great variation in coat color, but all are strikingly beautiful. Strong, heavily muscled, secretive cats, the males range from 130-200 lbs. They are strong and often drag their kill high into a tree to secure it from opportunistic predators. From that perch, they can feast at their leisure. This guy was asleep as we approached but quickly roused to size up the intruders. After some time, he finally tired of being admired and slowly slipped down the tree to vanish into the tall grass. Leopards have an exceptional ability to adapt to changes in prey availability and will take small prey if larger prey, such as antelope, are not available. Stealthy hunters, moving early mornings and late afternoons into the night, their coat allows them to simply disappear in the grass often surprising their target. Sharp claws and powerful jaws quickly overwhelm their prey. For many years, leopards were trophy hunted, their pelts prized possessions. This activity still poses a very real threat to their survival. Fortunately, most African countries have come to realize that tourist trade brings in more dollars than trophy hunting so leopards are protected in many areas, certainly in all the many Reserves and National Parks. Lets help the leopards keep their skins and shoot them only with our cameras.